Prince Of Peace [D7121] - $12.00 : Yarn Tree, Your wholesale source for cross stitch supplies. A cross stitch design from Scattered Seed Samplers. 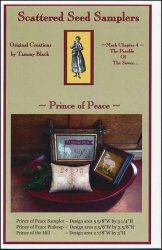 This pattern includes three different charts,"Prince of Peace Sampler", "Prince of Peace Pinkeep", and "Prince of the Hill". Stitch counts: Prince Of Peace Sampler 103w x 60h, Prince Of Peace Pinkeep 103w x 66h, and Prince On Hill 53w x 55h.